This project started out well the basis of it was when i was ripping out some crafting goodies from a box and i saw what was under the two cardboard layers. 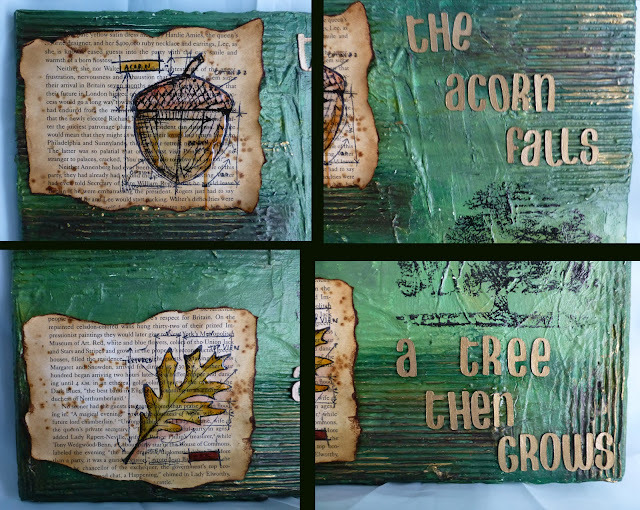 The 3 main images are from a set of Tim Holtz Stamps called AUTUMN BLUEPRINT and the other is a stamp from Sheena Douglas called THE MAGESTIC OAK These and a wide range of other great stamps singles/sets or collections are available from THATS CRAFTY ON LINE. A visit it highly recommended, as stock is always being updated all the time. As you know by now when i go on a art journey i like to show you all the ups and downs of that project. By doing this i hope that your not scared to make mistakes, thats its not the end of the earth and your able to rectify that error. So grab a drink, take a seat and lets go on this art journey. While im working on a 12 inch canvas i have a MDF square that i was lucky enough to have cut out for me when i was ordering some other cutting to be done @ the local D.I.Y Store. This helps when it comes to stamping, painting and gluing things to it. So if your able to have this done its something i can recommend. I have placed a photo below so you can see what i mean. Select a thickness of MDF thats going to work for most depths of Canvas's that have been attached to a wooden frame. The cardboard. The bottom sheet is what it looks like normally. The top sheet is what it looks like when one layer is removed. To help the cardboard adhere to the canvas i took a sanding block and just 'Sanded' the glossy side so that it would help keep it secured when glue was used. Ripped cardboard pieces were glued into place. Not just the surface but also the sides, by doing this it helps blend the over all finish of the project. To help even out the ridges that are made by the depth of the cardboard i used a moulding paste to help level the surface. Next step is to use our favourite base layer.... White Gesso. This will help us with the painting. Now then this is where i started to go wrong, well not wrong but the start of going wrong if you know what i mean. i had in my mind to use tisue paper that was embossed so that i could paint then stamped imagery and it wouldn't bleed out. So i first used Black Soot followed by Archival Jet Black to see which would give me the better final stamped image. To be totaly honest they are both the same when it comes to embossing. 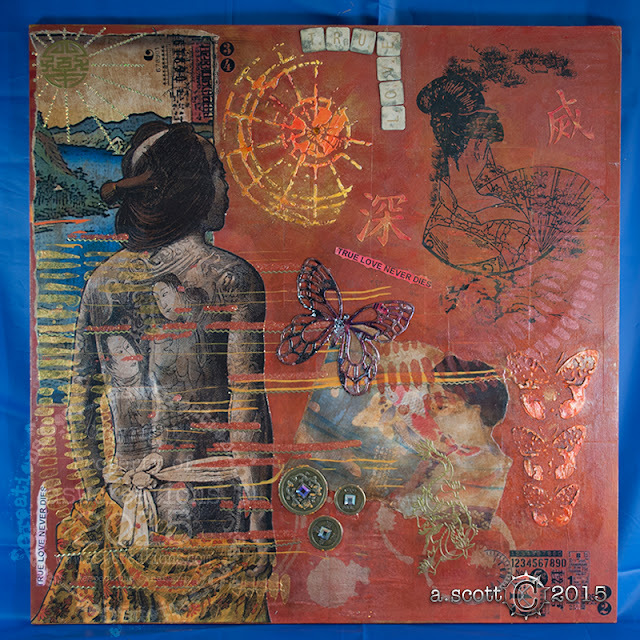 i put the stamped images aside while i started to work on the canvas. By placing several 'Blob's' [thats a technical term by the way] then using a wide tipped brush and a little water started to blend the colours into each other. If your brush starts to get thick with one colour use your sheets of 'Paint waste' paper to help remove some and start again. You can use a heat gun or just allow your canvas to dry naturally. i do like to allow the paint dry by itself as i had used a moulding paste i didn't want to crack that layer. As i looked at the canvas it looked a little flat and needed to have some depth in it. So i dived into my acrylic paint box and found a simple cheapo dark green paint. This was placed into sections just to add depth. i have never used well okay have played with but never used in a project my LuminArte Paints. As it included several greens and a gold this to was added to the canvas. I found that the luminArte paints didn't cover the painted layer but it added a layer of not glitter but a light background sparkle. If that makes sense? Close up of what l was maybe badly trying to say. As i wanted to protect the painted layer i used a thin layer of the Matte Decoupage glue. This would act as a barrier to almost everything i was going to throw at the canvas. Using the copper acrylic paint i started to put a layer of colour on the reverse side of my stamped image. By working on the reverse it would help soften the overall colour depth. After all the tissue paper images had been coloured and then using the same decoupage glue secured them onto the canvas. This was when it went all wrong. i just didn't like the way that the tissue paper looked on the canvas. it just looked as if they were an after thought and not part of the project. So what could l do next to save all this work. i didn't want to re paint the whole of the canvas. So armed with a baby wipe.. i started to scrub away at the tissue paper. One extra unforeseen advantage was that as i was scrubbing some of the paint was removed from the canvas. This was great as it now looked even aged which lead me onto what finally was the the finished project. i found my old books [from a car boot sale] and as i was going to age them with Tea and Coffee i had to use a waterproof ink. Stazon. [Please remember to clean your stamps with a good cleaner. Stazon will stain your stamps but if you clean them after use then they will stay as pristine as the day you bought them. Putting them on a plastic tray i first sprayed some warm water so that the paper would become more porous. While the paper was damp i first scattered some coffee granules onto the surface. So that i could regulate how much the coffee soaked into the paper by using a paper towel remove the extra coffee and water. As i had used the paper towel the paper was not saturated. i was now going to put even more water onto the paper. By using an old tea bag. i did use it to make a cuppa for myself but please DONT PUT MILK INTO THE TEA AND USE THAT BAG ON YOUR PROJECT. It has to be milk free. The paper towels i had used to help dry the stamped papers.. when dry would be a perfect addition to a project in the future so nothing is thrown away. 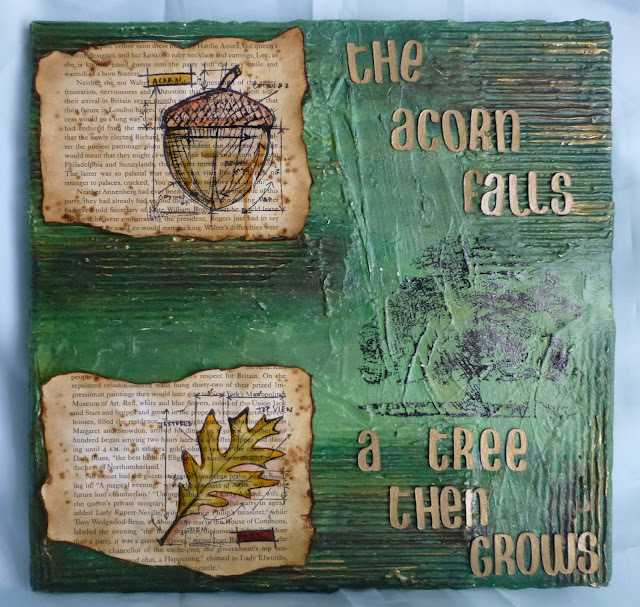 For the Acorns Tea Dye ~ Vintage Photo ~ Rusty Hinge ~ Brushed Corduroy were used. To help give the paper stamped images more of an aged feel, the edges were not distressed with a tool but the were rolled over and made to look as if they had been thumbed a lot. Then using Old Paper and Vintage Photo with the aid of the distressing tool the edges were distressed with ink. When i started to build up the canvas and by this i mean by placing all the items on the canvas and then playing with the placement something was just not sitting right. i then remembered a very big tree stamp that i had bought a few months ago. 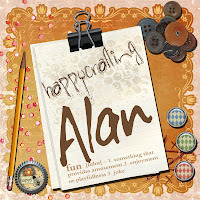 It would fit in perfectly with the paper stamps and the wording i was going to use. Using the stamp once again with the Stazon ink pad this time i didn't use a stamping block but by placing it onto the surface and then using my fingers pressing down onto the foam backing. it didn't leave a 'Perfect' impression but one that fitted in with the aged look. Before i started to secure all the items onto the canvas as i had walked away from it for a while i felt it needed something other than 'Green' so by adding brown and gold it would give a more wooden feel. if you click on the photo above your able to see how by adding those two colours gave the canvas more depth. To colour the letters an Old Gold Metallic paint was used. Securing the letters onto the canvas needed a very strong clear glue. In a tube there is not better that the Cosmic Shimmer PVA Glue. Its white to start with but dry's perfectly clear when dry no matter how much your using to secure your item. The final thing to do was to Varnish the leaf and the acorn. By doing this it would make them stand out. Again its back to Cosmic Shimmer as their Clear Varnish Lacquer is easy to use. self levels and dries crystal clear. Highlighted areas of detail. You can see the lacquer has given depth, also for some reason it might not have been 100% dry i stood it up at an angle and there is a little 'drippage' it works and i was not going to be put off by it. i hope you like this project its a different colour scheme from what i have used in the past. i'm happy that i can step out from that safety zone of colours that we tend to keep to. So now re look at the box that an item came in .. can you use it in another way apart from storage? If you have any questions then please send me a message and i will get back to you as soon as possible. Your canvas is stunning! The step by step tutorial is so helpful...thanks for sharing your art!